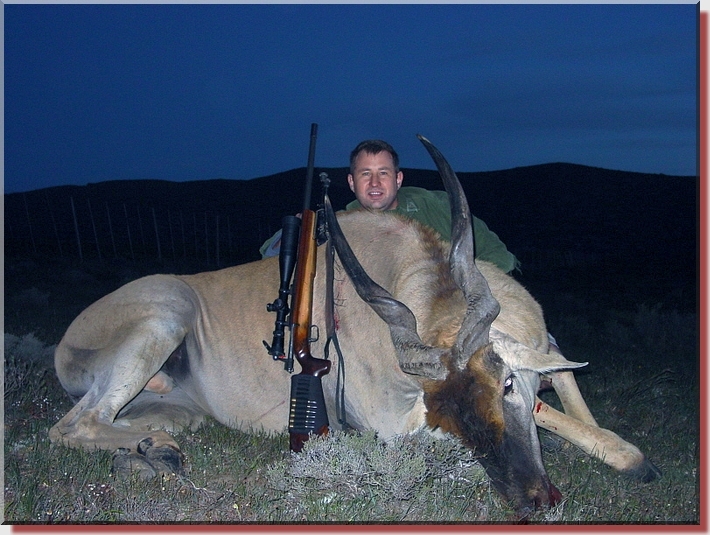 Louis shot this fine specimen of Eland on a farm in the Swellendam district.� He shot from a prone position at a distance of 100m.� Louis placed his shot low on the shoulder, right behind the front leg.� After the shot the Eland turned on the spot, but did not fall down immediately and Louis shot it again, higher than before. Within 50m from where it was hit the first time, the Eland collapsed. Louis used his 300 WSM and used the 160gr HV� loaded with 68gr 365, as recommended by Gerard.� Both shots penetrated the animal and Louis was satisfied with minimal meat damage. "I am very happy with the bullets and will definitely use them exclusively in future," says Louis.